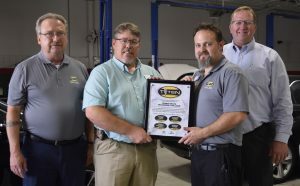 (WACO) – Texas State Technical College’s certificate program in Automotive Technology – Toyota Technician Training and Education Network, or T-TEN, specialization received nationwide certification at a ceremony Thursday afternoon. With the designation, TSTC is one of four two-year institutions in Texas offering the curriculum, along with more than 30 two-year colleges nationwide. T-TEN is a consortium of Lexus and Toyota dealerships and two-year colleges developing students with industry-backed training to work in more than 1,500 dealerships nationwide as factory-certified technicians. Internships are a key component of TSTC’s certificate program. Students perform three during the five-semester program. These opportunities are good for students to use in building resumes, said Warren Hastings, an instructor in TSTC’s Automotive Technology program. TSTC’s program can accept up to 27 students. Hastings said advances in technology and computers for vehicles tend to stir students’ interests along with a passion for cars and trucks. Students who graduate from the program are eligible to work at Toyota and Lexus dealerships. Once employed, workers get specialized training on new makes and models, especially as technology develops. Jody Trice, an instructor in TSTC’s Automotive Technology program, said faculty will next work on recruitment efforts at dealerships and high schools to build the certificate program’s participants. Graduates are needed to fill automotive technician jobs as workers retire. The Toyota T-TEN program began in 1986 and is in partnership with the Automotive Service Excellence Education Foundation. This entry was posted in Waco on September 6, 2018 by Daniel Perry.